With the innovation of technology, it is almost essential for everyone to make use of Text messaging apps. Use of a smartphone is common nowadays, and all of the native messaging clients are unable to handle MMS. To keep your messages well organized, you must need to own an app that provides great assistance especially when you are dealing business. Google App store is filled with great text messaging apps, but all you need is to recognize the needs and download the text messaging apps that will cater all your requirements. Textra SMS is everyone’s favorite app, which is clean and straightforward to use. It is one of the text messaging apps, which enables the user to avail flexibility and offers various customization options. It lets you get varied notifications, colors, themes, and use unique settings for every contact. However, if you want that your message style will switch to iMessage; Yes, it is the best app for scheduling SMS, providing quick replies and blacklisting as well. Download Best Android Chat App by clicking here. 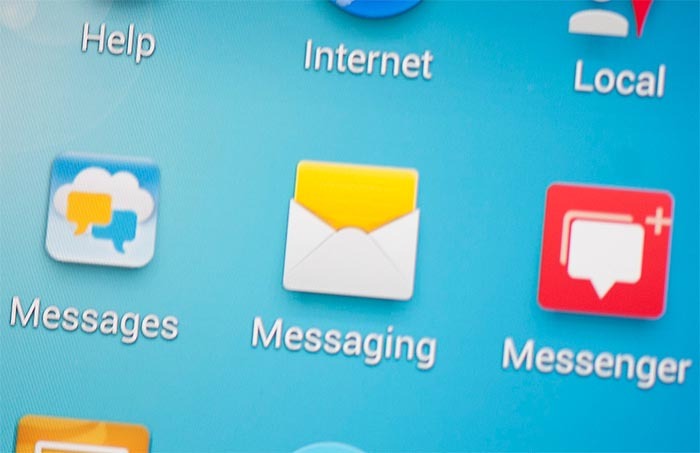 Android messages is a free text messaging apps for Android that lets you utilize various theming options, backup features and allows to use search feature as well. The design is entirely great and easy to use. Click here to download text messaging app. Chomp SMS is a great text messaging apps that is not exceptional than other apps. It is a perfect texting third party app that is evolving with time and is integrated with plenty features. The app includes quick reply, customized notification settings, blocking feature, group messaging and MMS. Click here to download android chat messages app free. If you are looking for the popular texting app, then Go SMS Pro will surely be an ultimate choice for you. It is an exceptionally designed app, which is available with tons of features along with dual SIM support, hundreds of themes, delayed text and even privacy box. Go SMS Pro is one of the text messaging apps that enables you to send private or encrypted messages to friends. However, the performance of the app is fast but offers many in-app purchases. Click here to download one of the great text messaging apps. Are you a moody sort of person? Then the fusion of text messengers or utilizing hundreds of emojis is a best idea. It is an alternative app of WhatsApp and is perfect to use. The application is persistent to provide best results with the engaging UI, themes, and many features that are more attractive. Now rattle off the quick text with mood messenger. All of the text messaging apps mentioned above works with the internet. If you want to revamp your experience of texting, then they will surely change your experience and lets you make a backup, blacklist the contacts, encrypt messages or chats and enables to use hundreds of themes with emojis and stickers. If the article is helpful, then support your friends by sharing it or leave your views below. Stay connected to Androidpowerhub.com.